Rotating crops is standard practice, and is relatively easy in the average garden. But crop rotation in a greenhouse or polytunnel is a little trickier, for two reasons. The first reason is obvious: space, or the lack of it. My greenhouse for instance contains only two small beds, which means a full crop rotation is impossible. The second factor is the limited range of crops that are usually grown under cover. Most years I grow tomatoes, capsicum and chillies in my greenhouse, which are all related and so cannot follow each other in a crop rotation schedule without the risk of transferring crop family-specific pests and diseases. A rotation gap of at least three years is the goal, but in practice any length of rotation is better than none at all. Even a single year’s rotation can interrupt the life cycle of pests and diseases, and helps spread out the demand on specific soil nutrients that are particularly liked by some crops but less used by others. If you grow plants from two crop families and have two greenhouse beds, you can simply swap them over each year. If you grow more than two crop families, you will need to make a decision – which to grow next to which. Try to choose plants that require similar growing conditions to partner up in a bed – tomatoes and cucumbers for instance can both use supports, and need potassium-rich soil and fertilisers to thrive. If you can only manage a one- or two-year rotation, consider taking a hiatus from growing one of the crop families every second or third year. Preserve as much as possible so you can enjoy your favourite homegrown foods for longer, and use the break to try out other, unrelated plants. It’s a great excuse to experiment with crops that are not typical greenhouse fare. 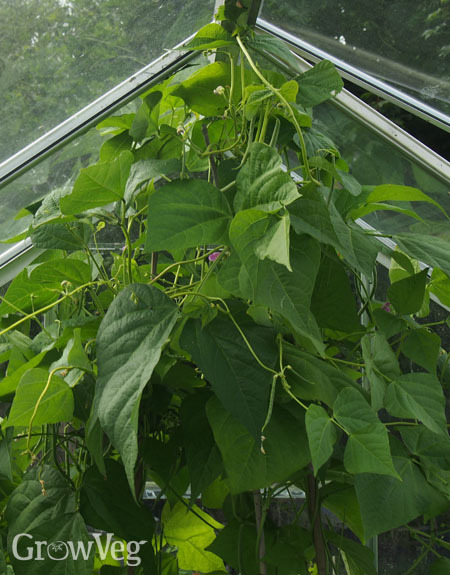 Climbing French beans often struggle in my windy garden, but in the greenhouse they grow lush and strong. As a bonus, the nitrogen left behind in nodules on the bean roots helps to enrich the soil. Tender herbs such as basil can be grown very successfully in a greenhouse too – a great excuse to make big batches of pesto! If you can’t bear to go a whole year without fresh aubergines or melons, consider giving the soil a complete rest and grow in containers instead. Lay newspaper or landscape fabric on your greenhouse borders as a weed barrier, and grow in pots or growbags on top. Or, make your own growbags by laying bags of multi-purpose compost flat. Punch drainage holes in the bottom then cut away the top of the bag, and plant straight into it. You can even grow some crops such as tomatoes in hanging baskets. Baskets full of wet potting compost and fruiting plants can become very heavy, so only try this if your greenhouse is very sturdy! If you have a sheltered spot outdoors, why not try growing your usual greenhouse crops outside, in containers or in the ground? Choose varieties that are described as hardier than normal or suitable for outdoor cultivation. The results might just surprise you! If the above options are not possible or practical it may be worth trying out a more drastic option – digging out all the soil in your greenhouse borders and importing new. This method has the advantage that it all but guarantees healthy soil, uncontaminated by pests or diseases, but there are a number of downsides. Firstly, digging out all the soil and barrowing in more involves considerable effort (growing in raised beds makes this a little easier). And buying in large quantities of fresh soil can prove expensive. It will disrupt soil life that may be better left undisturbed. And don’t forget, all that old soil needs to go somewhere too! It can be used to mulch other garden beds if you have them, but if your greenhouse is your only growing space it could be difficult or costly to get rid of. In the cosseted environment of a greenhouse, pests can easily thrive and fungal diseases can take hold with alacrity. If you’re working with a short crop rotation (or – gasp! – no crop rotation at all), then it’s imperative that your soil is in the best condition possible. Regularly adding organic matter is the answer. Well-rotted compost and manure are nutrient-rich options, but leafmould, straw, grass clippings, wood chip or any other organic matter can be used. Simply lay it on top of the soil so that earthworms and other soil organisms can gradually drag it down. Used in summer after watering, it also helps to lock in soil moisture. At the same time it helps improve soil structure, no matter what your soil type. Growing any green manure crop helps to build good soil, but mustard has a very special added benefit. When the growing plants are cut down and mixed into soil, it has a biofumigant effect that can help suppress some plant diseases and pests. It’s no substitute for proper crop rotation, but is worth including to bolster plant health. Chopping up and crushing the plant material releases the biofumigant. It should be incorporated into the soil as soon as possible after cutting down – ideally within minutes – and watered. You can plant into the soil a couple of weeks later. Mustard can be sown in late summer and incorporated in autumn, or leave it until spring. Mustard won’t survive winter outdoors in cooler areas, but may well make it through under cover. Restricting crop rotation isn’t desirable. However, in the context of such a limited growing space it is often necessary. Keep problems to a minimum using a combination of the above techniques, and treat the greenhouse and any pots to a thorough annual clean to flush out pests and diseases. Growing plants under cover successfully needs strategic thinking, but the rewards can be immense.